*Article originally printed in the August, 1984 edition of Country Song Roundup magazine. Young country fans know Grady Martin as the lead guitarist in Willie Nelson’s band, but he is much, much more. His contributions to the development of the Nashville Sound as a studio musician in the 1950’s and 1960’s have been incalculable. Franks said that in December 1983, at a tribute dinner held in Martin’s honor by the Nashville Music Association On that occasion, Grady was lauded by his peers and given the first Master Tribute Award, designed to honor the unsung heroes of music: the backup instrumentalists. On hand were Brenda Lee, Floyd Cramer, Chet Atkins, Jerry Reed, The Jordonaires, and a ballroom of other celebrities. Willie Nelson hosted the tribute to his friend and bandmember. Studio musicians got their due at long last that night. Finally it was stated publicly that Grady Martin was the session leader for the hundreds of hit productions that put Nashville on the map. He was a chief architect in the building of Music City. He inspired Grady so much that the youngster was soon one of the most accomplished fiddlers in the area. When Nashville radio star Big Jeff Bess came south for a show, Martin was played for him backstage. Impressed, Bess offered the 15 year-old a job. “We had an early-morning radio show, and just played schoolhouses and anywhere we could. Four or five dollars a night was a good night’s pay. This was during World War II.” Bess was the husband of the legendary Hattie Louise “Tootsie” Bess, later immortalized as the owner of Nashville’s Tootsie’s Orchid Lounge Bar, across the alley from the Ryman Auditorium downtown, mother church of the Grand Ole Opry. “I went up to the Opry one Saturday night and met manager Jim Denny. I was just askin’ for a job with somebody on the show. And he turned me on to The Bailes Brothers. So I traveled and appeared with them for awhile.” At the time the group was riding the crest of a wave of hits that included Dust on the Bible, I Wanna Be Loved (But Only By You), and As Long As I Live. Martin toured with such Opry headliners as Jamup & Honey and Uncle Dave Macon. When he began appearing with trick fiddler Curly Fox and “The Sophie Tucker of Cowgirl Singers,” Texas Ruby, he switched to guitar. Thus, on that instrument he made his recording debut when Fox took him into a studio in Chicago. Artists like Carl Smith, George Morgan, and Little Jimmy Dickens began using him on their sessions. Hall of Fame member credits Martin and guitarist Jabbo Arrington for developing his hit sounds= with their twin-guitar playing. Martin even played (fiddle) on a Hank Williams session. He also accompanied Williams to “The Kate Smith Show” in New York in 1952, country music’s debut on prime-time, nationwide network TV. As Red Foley’s airplane pilot and lead guitarist, Grady Martin accompanied Foley on his commutes to Springfield, Missouri. There he became the band leader on the Foley-hosted “Ozark Jubilee,” the first network TV country variety series. He maintained his ties to the infant recording center in Nashville, however. Kitty Wells, Ernest Tubb, Webb Pierce, and dozens of other Nashville pioneers featured him on their hit records. “I guess the person I played the most hit licks for was Marty Robbins,” says Martin wistfully of his old friend. That’s Grady’s Spanish-style picking embellishing El Paso, and on Don’t Worry he developed the electric fuzz-tone sound that was to influence an entire generation of psychedelic electric-guitar stylists. He played vibes on Floyd Cramer’s timeless Last Date. He played dobro/guitar on Wilma Burgess’ lovely Tear Time. He banged tambourine and played the banjo lick on Wings Of A Dove by Ferlin Husky. Grady also arranged (and wrote) Joe Henderson’s Snap Your Fingers (1962), perhaps Nashville’s first black top pop hit. The following year, he arranged and published Our Winter Love, one of Music City’s biggest ever pop instrumentals. He played on all the hits of Patsy Cline and on all the worldwide million-sellers of Brenda Lee. He’s on Elvis Presley’s movie soundtracks. He’s on Gone (Ferlin Husky), Saginaw Michigan (Lefty Frizzell), Waterloo (Stonewall Jackson), Uncle Pen (Porter Wagoner, Grady’s last major session as a fiddler), Devil in Disguise (Elvis), Oh Pretty Woman (Orbison), I’m Sorry (Brenda) and For the Good Times (Ray Price). Jim Reeves, Johnny Cash, Dottie West , Loretta Lynn, Conway Twitty, Larry Gatlin, and Kris Kristofferson records all feature Grady Martin. In fact, it would be easier to name the Nashville stars that he has not accompanied in the studios than it would be to list all he has. Surrounded by such “A-Team” pickers as Bb Moore, Buddy Harman, Ray Edenton, Harold Bradley, Hank Garland, Pig Robbins, Pete Drake, Floyd Cramer, Tommy Jackson, The Anita Kerr Singers, The Jordonaires, and a handful of others, Grady Martin forged a sound and style. Never before or since in the annals of popular music have so few been so responsible for so many hits. At his peak, his reputation spread to pop musicians like Perry Como, Al Hirt, Theresa Brewer, Bing Crosby, Rosemary Clooney, Henry Mancini, Tab Hunter and Burl Ives, all of whom used his talent on records, Martin’s own recording group, The Slewfoot Five, was a pop/jazz act. 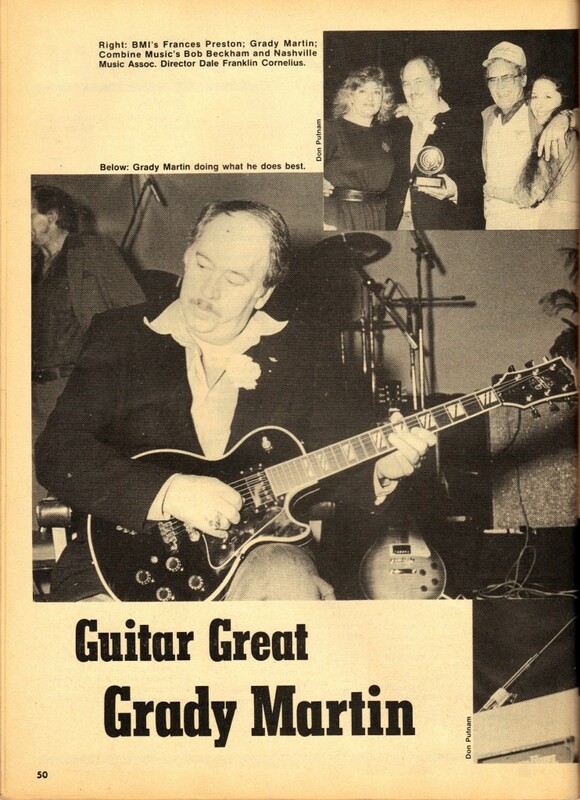 As the 1970’s dawned , Grady MArtin returned to playing live on the road. He served a stint in Jerry Reed’s band before Reed made so many movie-making commitments. Requested by Willie Nelson to play on the soundtrack of the film Honeysuckle Rose in 1979, Martin wound up serving as the model for the Slim Pickens character in the movie. He has remained with Nelson in the 1980’s, both touring and recording with the superstar. Nelson remembers Grady from when he played on a then-green songwriter’s first album. Now Martin plays guitar on such huge Nelson hits as the Merle Haggard duet, Pancho & Lefty. He’s wrong. He’s much more than a “factory worker.” He’s 0ne of the creative geniuses in the history of country music.